1. Change the Cartridge. Check your cartridge levels. 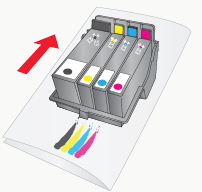 If the lowest percentage color corresponds to a missing color in your print, replace that cartridge. 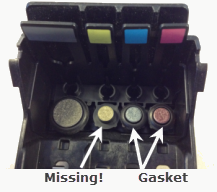 Even if the software reports that the cartridge has 30% ink remaining, it may still be empty and need to be replaced. 2. Go to Tools menu – Choose Printer Properties/Tools and click Clean Printhead. You will need an inkjet printable disc in the input bin for this process. You may need to repeat this process up to 4 times depending on how clogged the printhead is. Only repeat the procedure if you start to see improvement after each clean print. During this process the printer will make several loud whirring noises. This is normal! This is the sound of a pump forcing ink through the nozzles. If you do not hear this sound, the clean purge print did not complete successfully. Try again. Always keep the 4100 plugged in and turned on. The printer will do periodic maintenance to make sure the nozzles do not clog. 8. Print Quality Setting. Set the Print Quality level to "Best". The lower (and faster printing) quality may not be sufficient for many solid color areas. Increasing the quality increases print time because the printer makes more passes over the media. However, it also produces a more consistent print. Higher quality settings do not consume significantly more ink than lower quality settings. 9. Replace Printhead/Cartridge. The cartridge may be empty or defective. The printhead nozzle for one color could be clogged. The fastest way to diagnose a quality problem is to have backup printheads and cartridges available for comparison testing. If a color is missing, replace that color cartridge. Next try replacing the printhead. 10. Update Firmware. If you have recently changed your printhead and notice offset, blurry or shadow text, you must update your firmware. The estimated printhead life is approximately 26 black or 32 (of any) color cartridge changes, whichever comes first. This is not a guarantee of printhead life. The printhead could last longer or shorter than this depending on many environmental and use factors.